Hello! 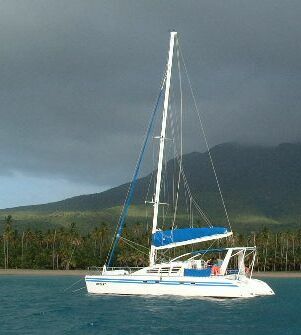 Welcome to the virtual sailing trip with Sue, Jon, Chris, Amanda, and Arthur (the cat) on Ocelot, our 45-ft catamaran. We've started out in the Caribbean, heading basically south, then eventually west through Panama. Our goal is to stay out for two years, and probably end up in New Zealand or Australia, where we'll either sell or store the boat and return to the States. After three and a half months in St. Martin and its surrounding islands we headed south on April 7. We stopped briefly in St. Kitts, Nevis and Montserrat (the volcano was wonderful) then sailed on down to Guadeloupe to meet friends. 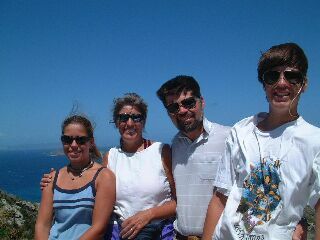 We sailed with them to the Saintes, Dominica, and ended in Martinique. 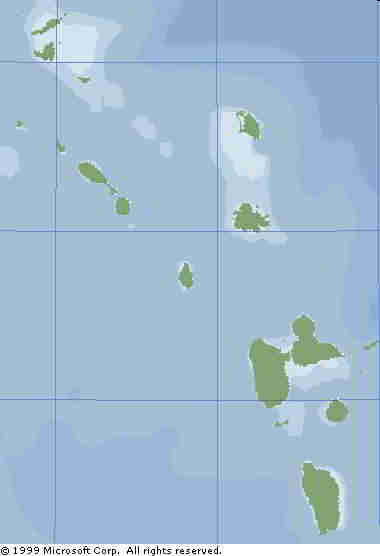 This map shows Anguilla in the upper left, with St. Martin/St. Maarten directly below that. Guadeloupe is the butterfly-shaped island, with the little Les Saintes below. The lowest-most island on this view is Dominica. What common Caribbean animal could be described as a feathered torpedo bomb? What command issued by the captain to the helmsman should never be obeyed literally? What piece of rigging on Ocelot came loose at sea, and could have resulted in our dismasting? What is a cruiser's nemesis? If you're wondering where we are, or where we've been, (and what we each thought about it) check out the Landfalls page. On the Ocelot page you can take a virtual tour of the boat, and read its specifications and our impressions of the boat. If you want birds, recipes, and comments on the cruising life and changes to the Caribbean in the past 14 years, check out Sue's pages. Chris writes about his projects and schooling. And Amanda brings lots of pictures, plus stories about our adventures in Africa and New Zealand and Australia from past trips.